The Bristol Type 138 High Altitude Monoplane was a British, high-altitude research aircraft of the 1930s. The Type 138 was a single-engine, low-wing monoplane with a fixed, tailwheel undercarriage. The Type 138 was born of a period of intense competition between aviation manufacturers in the 1920s and 1930s. There was a great deal of prestige, as well as technological progress, to be gained from breaking one of the major aviation records: airspeed, distance and altitude. By the 1930s, absolute speed and distance records had passed beyond the compass of individual companies and required the active collaboration of national governments. As a result, the focus of companies centred on high-altitude development. Bristol were well placed to move in this field but in the event, they found themselves lagging. Between 1929 and 1934, there were a number of altitude records established by rival machines including a Junkers W.34, a Vickers Vespa and a Caproni Ca.113 biplane, as well as the first flight over Everest by a pair of Westland Wallaces in 1933; all these aircraft used Bristol or Bristol-designed engines. Divining Air Ministry interest from the Everest expedition, Barnwell proposed a purpose-built, high-altitude, research aircraft in November 1933. This Type 138 was a large, single-engine, single-seat monoplane with retractable undercarriage and a highly supercharged Pegasus engine. Nothing came of this until Renato Donati set a new record in April 1934; public opinion demanded a new, government-sponsored record attempt. In June, the Air Ministry issued Specification 2/34 for two prototypes capable of reaching 50,000 ft (15,030 m). Barnwell revised the Type 138 to produce the Type 138A. This was of the original size and configuration but had a special, two-stage supercharged Pegasus and, although remaining basically a single-seater, had provision for an observer's cockpit to be fitted if required. Weight-saving was a priority; the airframe other than the steel tube engine mount was a wooden monocoque and the undercarriage was replaced with a lightweight, fixed assembly. The supercharger installation, with detail work by Clifford Tinson, was a two-stage system; the first-stage compressor was permanently engaged but the second-stage was engaged by the pilot at the correct height. The system employed an intercooler between first and second stages. Much research was carried out by the Royal Aircraft Establishment and National Physical Laboratory both to establish the most efficient design for the aircraft and to develop a reliable pressure suit for the pilot. Sir Robert Davis of Siebe Gorman and Professor J.S. Haldane were instrumental in developing the helmet. 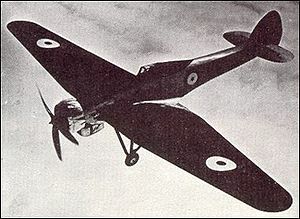 The aircraft was complete in early 1936 and was flown for the first time, from Filton on 11 May, piloted by Cyril Uwins, who had flown the Vickers Vespa on its world record flight. Two more flights were made, the pressure helmet was tested at Farnborough and the aircraft was returned to Filton for the special four-blade airscrew to be fitted. On 5 September, the 138A was deemed ready and was flown back to Farnborough. Squadron Leader F.R.D. Swain was selected to pilot the high-altitude flights. On 28 September 1936, Swain took off from Farnborough and climbed to an indicated 51,000 ft (15,440 m), engaging the auxiliary supercharger at 35,000 ft ( m). Swain ran low on oxygen on the two-hour flight and had to break the window of his pressure helmet once he had descended to a safe height. The data from this flight was homologated by the F�d�ration A�ronautique Internationale as a world's record of 49,967 ft (15,230 m). After this flight, further development of the aircraft resulted in a number of small modifications. In this mildly revised form, the 138A made six further flights to around 50,000 ft (15,240 m). During this period, Italy increased the record to 51,364 ft (15,656 m). In response, on 30 June 1937, Flight Lieutenant M.J. Adam undertook a 2�-hour flight in which he achieved a record altitude, later homologated at 53,937 ft (16,440 m). Despite the cockpit canopy cracking, Adam was saved from injury by his pressure suit . After this, research flights continued but no further records were attempted. A second machine was ordered as the Type 138B in 1935. This was to be a two-seater powered by a Rolls-Royce Kestrel S engine fitted with a similar two-stage supercharger installation and generating 500 hp (370 kW). The airframe was delivered to Farnborough Airfield in 1937 for completion but the engine installation was never completed.